Before you ask, these aren’t the Intel Cannon Lake processors you were hoping for. Rather, today Intel is launching its third-series of 8th Generation mobile processors, promising slightly improved performance over Coffee Lake and much greater focus on connectivity. Intel’s three new new 8th Gen Intel Core U-series processors (code-named Whisky Lake): the Core i7-8565U, i5-8265U and i3-8145U, will come with integrated Intel Wireless-AC modules for Gigabit Wi-Fi for up to 12 times faster connectivity speeds. Intel also promises Whisky Lake CPUs will garner two times better performance, compared to a 5-year-old PC. Compared to a 7th Generation Kaby Lake processor, we supposedly can expect double-digit gains in office productivity for everyday web browsing and light content creation. As with every iteration of its processor, Intel expects laptops and 2-in-1 devices will last even longer, up to between 16 and 19 hours on a single charge. The chip maker has also said gamers on the go will be able to play ‘World of Warcraft: Battle for Azeroth’ and ‘World of Tanks’ with ease using just its integrated graphics alone. Lastly, the new U-series processor can also support Dolby Vision HDR and Dolby Atmos immersive audio. All of these improvements comes by way of the 8th Generation platform's new PCH, which integrates a quad-core audio DSP and integrated wireless MAC to support the 802.11AC w/ 160MHz channels. It remains to be seen whether these processor will replace the Coffee Lake processors Intel just announced in April 2018 or the Kaby Lake-Refresh processor that launched a year ago, or will they just sit alongside the existing two families as an option for users who want to stay connected. 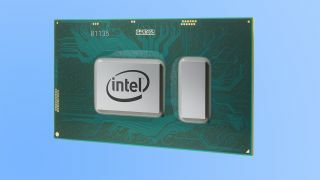 Intel also introduced a new trio of Y-Series 8th Generation Amber Lake processors (including the Core i7-8500Y, i5-8200Y, m3-8100Y) that bring forth even more connectivity support. Unlike the new Whisky Lake CPUs, Amber Lake doesn't integrate built-in Wi-Fi modules. But it does support Gigabit Wi-Fi by way of external or discrete modules, and it has preloaded eSIM support for Intel’s Gigabit LTE modems. Now, that doesn’t mean these new Y-series chips come with a built-in LTE module, like Qualcomm’s Snapdragon 835 chips inside always online Windows 10 devices. Rather, it just has the eSIM support ready for manufacturers who also want to include an LTE modem in the device. The integrated graphics on Y-series chips has also been slightly improved, giving users the ability to watch 1080p, 4K or 360 videos (and preview multiple video streams) with ease. An Intel spokesperson also told us we can expect up to 9.5 hours of battery life while playing a 4K 10bit HEVC video on local playback. Intel promises that these new Y-series chips will deliver double-digit gains in performance compared to the previous generation processors in the thinnest and lightest laptops and 2-in-1s on the market. Otherwise, there’s improved touch and stylus interaction for users who want to sketch, shade and paint with precision on an Amber Lake-powered touchscreen device. The silicon company expects the new Y-series chips will enable thin-and-light designs less than 7 millimeters thick and lighter than 1 pound.